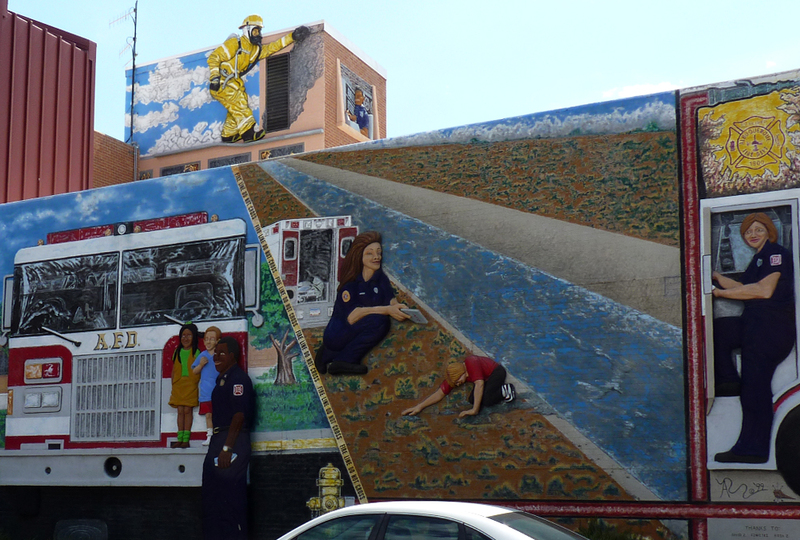 This acrylic and fiberglass sculptural mural depicts various aspects of firefighting, including a fire truck, a firefighter scaling a wall, another on top of a burning building and a fire hydrant. It demonstrates the unyielding courage in the fulfillment of duty and uncompromising compassion for the communities they so proudly serve and speaks to the department’s traditional mission administered from this location. Firefighters do more than put out fires. They respond to both natural and man-made disasters such as floods and car accidents; they keep a watchful eye on the community; and they respond to around-the-clock medical emergencies of all types. In addition, the firehouse serves as a community resource for neighborhood associations and other citizen groups.